Minnesota’s 14 Amish settlements are clustered in two regions: the extreme southeast near the Iowa border, and the central-northwest. Amish first settled in Minnesota in the late 1800s, forming two short-lived communities. Today, Minnesota’s Amish population numbers more than 3,000 (see Young Center 2010). Other MN Amish communities-Wadena, the oldest Minnesota Amish community, was founded in 1972. Other settlements can be found in Clearwater County, Becker County, and Polk County. The Harmony Amish community was founded by Swartzentruber Amish from Wayne County, Ohio, who began settling in this corner of Fillmore County in 1974. Like other Swartzentruber Amish, this conservative group uses only limited technology in their homes, businesses, and buggies. The Amish of Harmony make a living by farming, working construction jobs, and like Swartzentruber counterparts in the Ethridge, Tennessee Amish settlement, various communities Ohio, and numerous other states, by operating low-tech businesses. Basket, furniture, and quilt-making are popular here (read more here on Amish furniture in Minnesota). Jams, rugs, quilts, baked goods, and cashew crunch are among the items available for sale at local Amish homes. The Harmony Amish community is by far the largest in Minnesota, at 7 church districts, and currently the third-oldest settlement in the state. As in other sizeable settlements, a small tourism industry has developed here. In addition to the businesses the Amish themselves run, visitors to the area are catered to by tour companies which visit Amish farms and merchants and provide information on the community and Amish way of life. Another Fillmore County settlement is found not far from Harmony, at Granger in the southern end of the county. Granger’s southern border is formed by the Minnesota-Iowa state line; its “twin village” of Florenceville, Iowa lying just across the line. The Amish settlement here actually spills over the state line, with families living on the Iowa side of the border. At 3 church districts, the Granger settlement is the 2nd-largest in the state. It’s not unusual to find one area being home to a large number of separate Amish groups. Amish belonging to different affiliations–either more conservative or more liberal–are nonetheless attracted to settle in areas where other Amish already live. They may be attracted to a given locale for similar reasons–low land prices, or absence of tourism, for instance. Amish moving to an area where Amish already live know that locals are likely to be used to the presence of Amish. 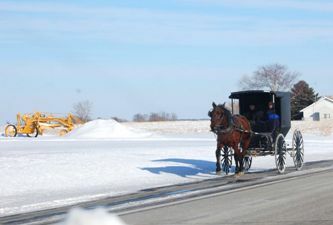 Close contact with other Amish groups, even those more progressive or conservative, can help ease the move to a new area, with new arrivals benefiting from advice or by patronizing established businesses, such as buggy makers or plain clothing retailers. 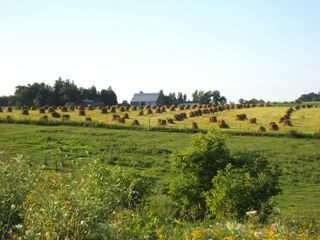 Examples of areas where multiple groups have settled include the Amish communities of Clark County, Wisconsin, and the heavily-Amish Mohawk Valley in New York. Todd County in central Minnesota is another such place, today home to five separate settlements. The first Amish arrived in Todd County in 1973, settling near the village of Bertha. In 1995, another settlement was established at Long Prairie, with a further two communities arising in the early 2000s, at Clarissa/ Browerville, and another near Bertha. Amish have continued to arrive in Todd County, with a settlement recently established at Eagle Bend (see Amish Settlements Across America: 2008, David Luthy). In 2005, a rare polio outbreak occurred among Amish at the Long Prarie settlement, bringing attention to the reluctance of some Amish to undergo vaccination. In addition to the above, a number of other settlements exist in the North Star State. The oldest Minnesota Amish community, near Wadena in Wadena County, was founded in 1972, and numbers 2 church districts today. Polk County is home to a pair of settlements, at Fosston and Fertile, both established in 2007. 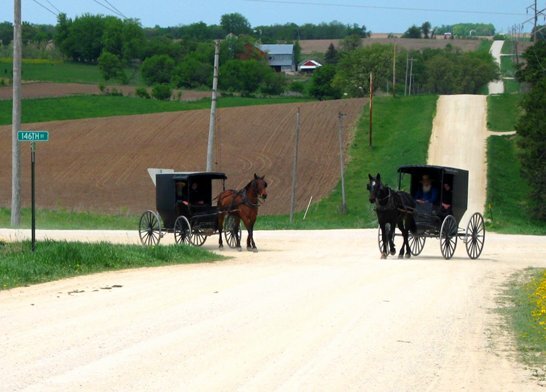 Other Amish communities can be found in Becker, Clearwater, and Winona Counties. A pair of Amish settlements existed in Minnesota around the turn of the century. These two communities were both located in the southwestern corner of the state, in Nobles and Jackson Counties. The first settlement was established near Wilmont in Nobles County, by settlers from Waterloo County in Ontario. Settlers bore surnames less-common in Amish society today, including Jantzi, Gascho, Kennel, Kropf, Iutzi, and Gerber. Some of these names are still seen in Canadian Amish communities, however. Amish settlers did carpentry work and raised crops including corn, wheat, oats, barley, hay, and potatoes. Eventually, this settlement failed, as Amish historian David Luthy explains, due to a mixture of affiliations within the group. 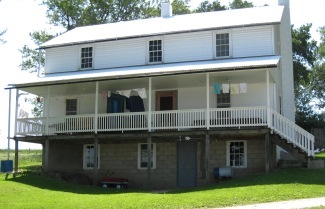 The Wilmont community, according to Luthy, “was traditional enough to fellowship with some Old Order Amish but had historic and family connections with the meetinghouse groups in Ontario and received an occasional visiting minister from there.” (Settlements that Failed, Luthy p. 213). The “dual nature” of this community–Old Order Amish, and Amish-Mennonite–led to its eventual total disbandment in 1910. A second Amish community followed shortly after the Wilmont community was founded. A land agent succeeded in attracting Amish settlers, mainly from the Arthur, Illinois Amish settlement, to Jackson County in 1894. Amish in this area primarily farmed wheat, which they were able to transport to market thanks to Jackson County’s good train connections. Fishing in the county’s lakes, sometimes with pitchforks, and sometimes by simply cutting out fish caught in the thick winter ice, was a popular way of supplementing food. 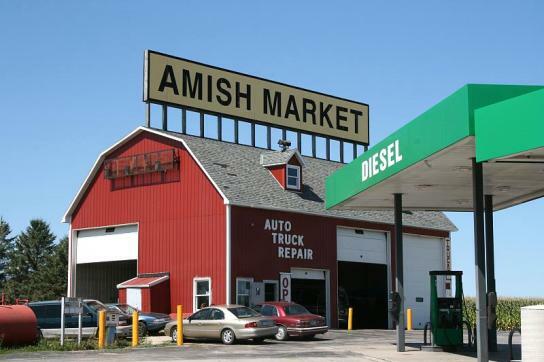 Like most other Amish settlements in the upper Midwest, the Minnesota Amish communities are remote from large population centers. This distance, and the correspondingly cheaper farmland, has continued to steadily attract Amish settlers over the past few decades. 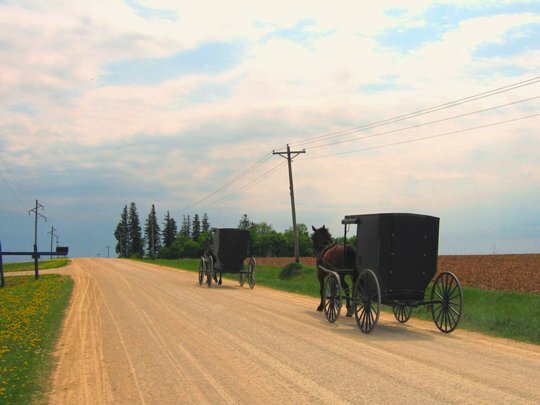 The Young Center for Anabaptist and Pietist Studies reports that Minnesota Amish population growth has been robust, with an increase of 178% over the past 20 years. With the large amount of sparsely-populated land available, Amish growth in the state is likely to continue at an above-average pace.